Mikenna was to pick a person from history for a social studies project. She had to dress up like them and memorize four facts about them. I gave her a few people to choose from and she picked Neil Armstrong because she "likes space". I was having a heck of a time trying to find items to make a space suit and the plan I did have turned out to just look dumb. 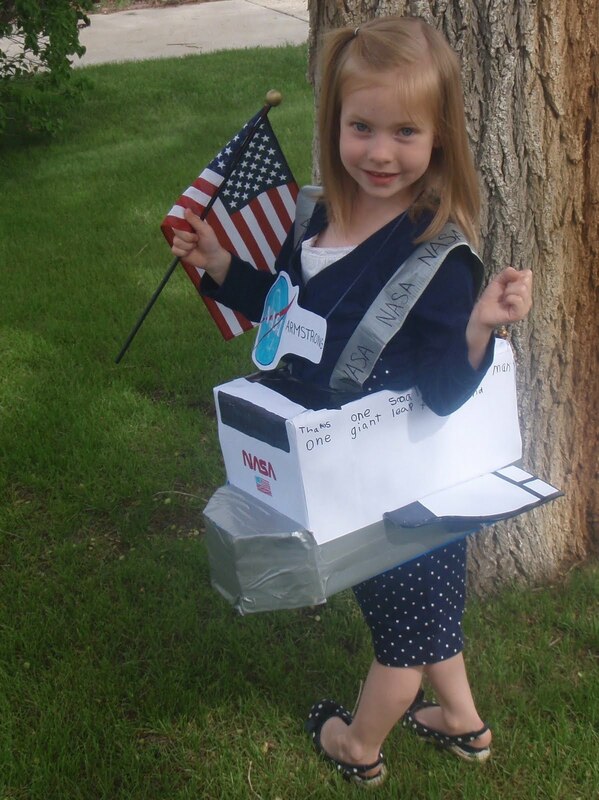 So I was scrambling to figure out what I was going to do, I ended up making a rocket ship with a box and she wrote on the side "That's one small step for man, one giant leap for mankind." and "Apollo 11". On the top she also wrote, "To the moon or bust!" While I drew NASA logos and flags on it. It turned out to be super cute, we got so many compliments on it! Apparently I do my best work when the pressure's on! haha :) At school, they mixed up the kids from different grades and classes to put on a presentation of the person they were portraying. Adiee, Isla and I packed up the picnic basket and headed to Mikenna's school for their last blast picnic. We ate lunch, played on the playground, did a bean bag toss, donuts on a string, got ice cream, and watched Mrs. Geise get dunked in the water over and over and over again! What a great sport, she just kept getting on that thing - it looked exhausting! All three girls fell asleep before we had left the parking lot... They had a great time!